Our company KING.NET and other million websites goes down for one hour today around 3pm EST because the hosting provider ... drumming ... GoDaddy is completely shut-down. This is not the first time GoDaddy had experienced an outages, read it at Mashable GoDaddy Gone for details. It's unfortunate that some companies used GoDaddy for web hosting and email services too. In that case, their customers can't communicate with them using email, that's where Twitter really help out. They able to tweet the outage and inform their clients. If you're one of the GoDaddy customers, will you consider moving out of their hosting service? It is worth your time to transfer to another hosting service providers? It will be stable? No assurance of course but maybe less downtime. For QUE.COM Game Studio, I decided to use WordPress.com and Amazon S3 to host our website for games announcement, news/update and downloads to minimize risk of web downtime. 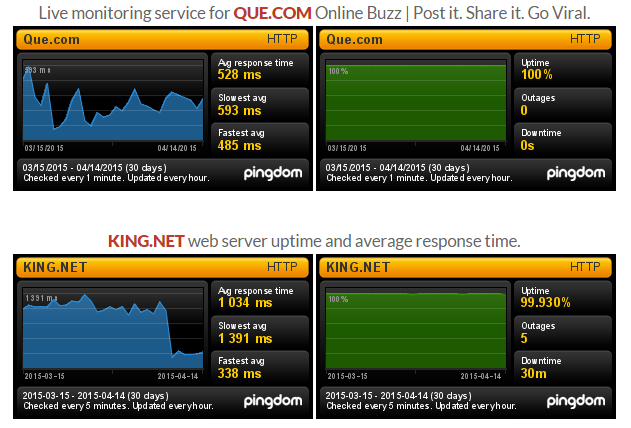 See the figure below, as of April 13, 2015 QUE.COM with WordPress.com zero downtime while KING.NET with GoDaddy 5 outages of 30 minutes. Got any hosting service provider in mind? Please let us know. WordPress version 4.2 still vulnerable. Google Search: Is your site mobile-friendly?